Say you have a lot of money to spend and you are an environmentalist then the Loki Playhouse Set is for you. 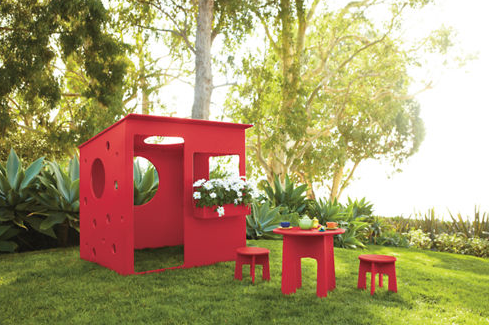 Made of 100% recycled plastic, this playhouse for kids also extends into a pretty comfortable outdoor furniture line and comes in vibrant primary colours but also great monochromatic ones too. This will definitely make your kids happy and will not transform your backyard into a bad multi-coloured garbage dump. Available from Room & Board.